Today we come back at Villa Pestalozza, wonderful wedding venue on Lake Orta. 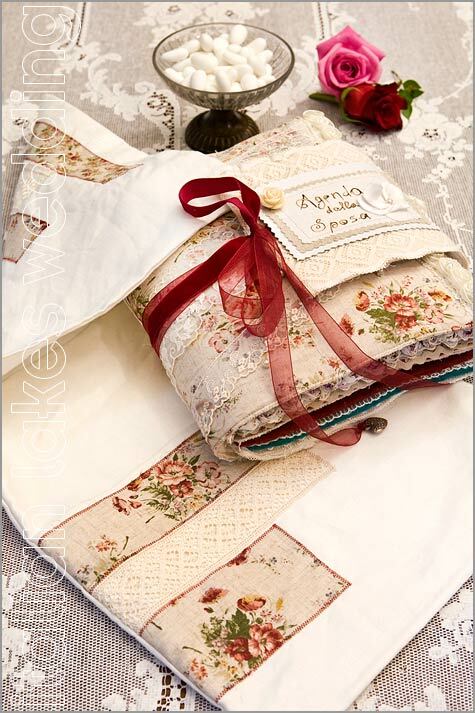 It was chosen by magazine Milleidee Home Decor as perfect frame for a wonderful shabby chic photography set. Shabby Chic is the trend of the moment. It is more than then a trend it is a way of life. 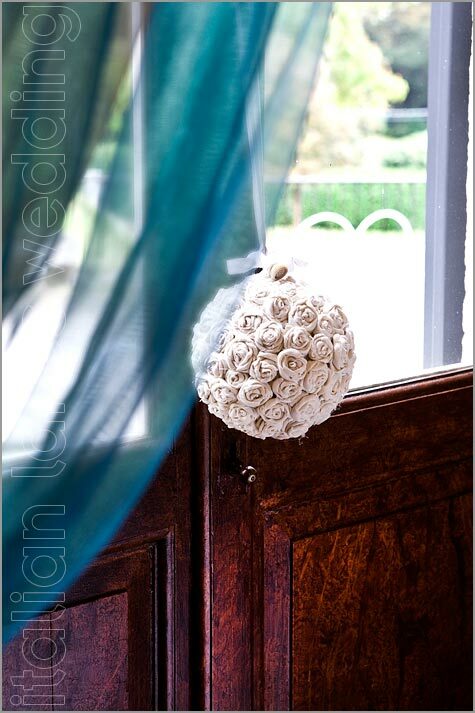 It could be a lovely idea for your wedding decor, it could add a touch of charming elegance to your wedding venue. 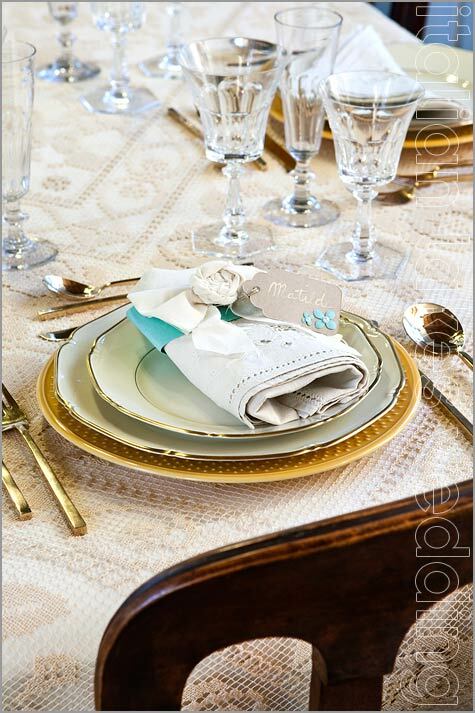 It could be used for informal parties but even for the most elegant ones! 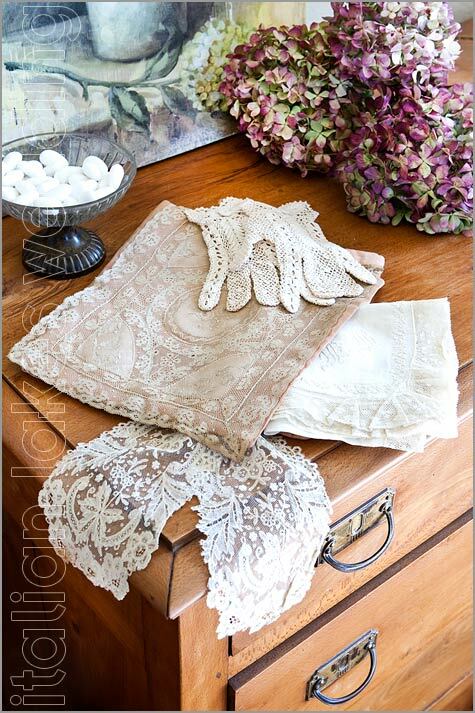 Shabby Chic is made of romantic contrasts between elegance and vintage. 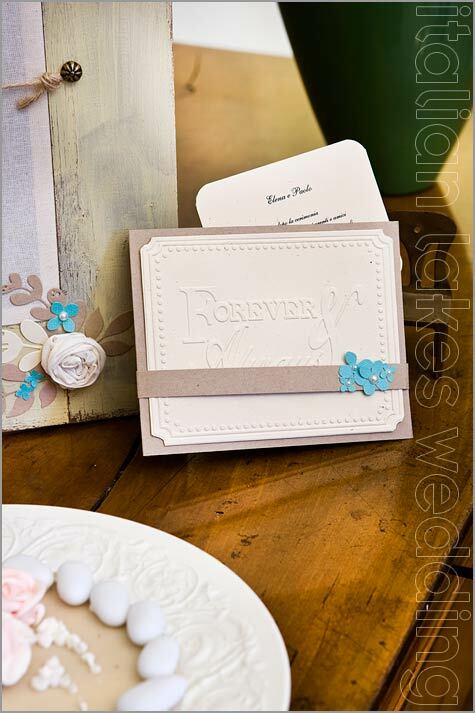 It could be ideal for a spring or summer wedding. 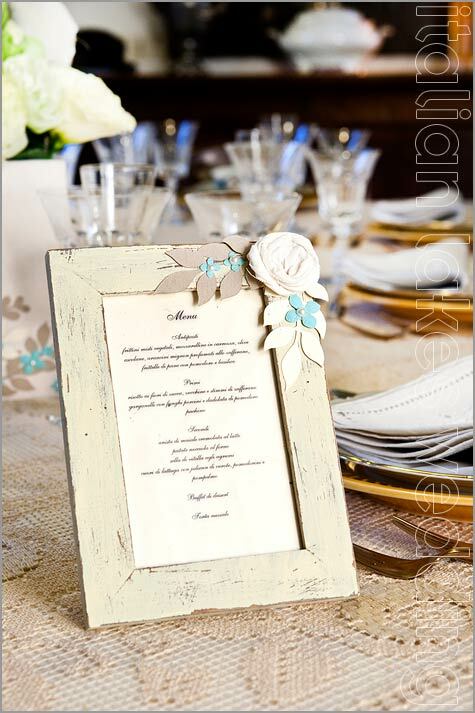 You can use pastel colors and a touch of eco friendly details to make your wedding simply unique! 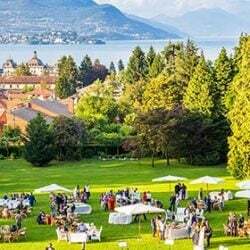 Villa Pestalozza with its familiar atmosphere and vintage appeal can offer the perfect set for a shabby chic event on Lake Orta. In our February post we told you about wedding dresses, party gowns, hats and gloves. 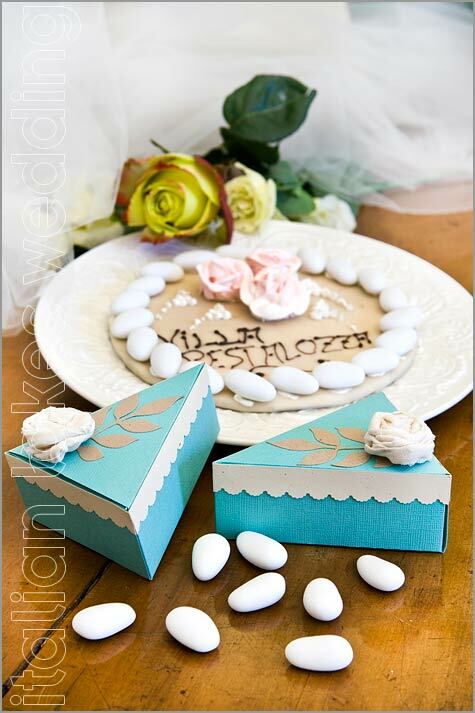 Today we would like to tell you about some wedding details. 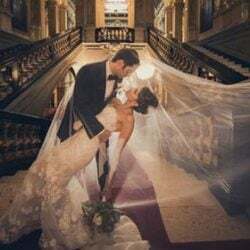 On a wedding day everything should be perfect so every single decoration could add a touch of magic that you will remember forever. Shabby Chic style mix new and old. We could use vintage laces. They have been created by Tania Santarelli. 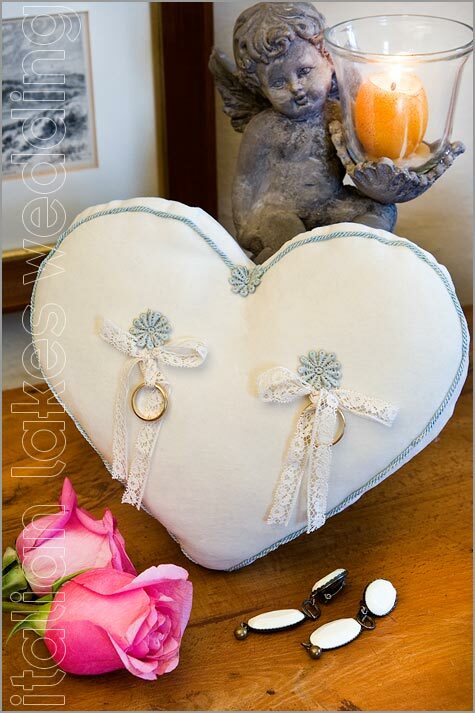 Simple yet elegant an ivory velvet cushion for your with turquoise embroidery for your wedding rings. Creation by My Country Nest. 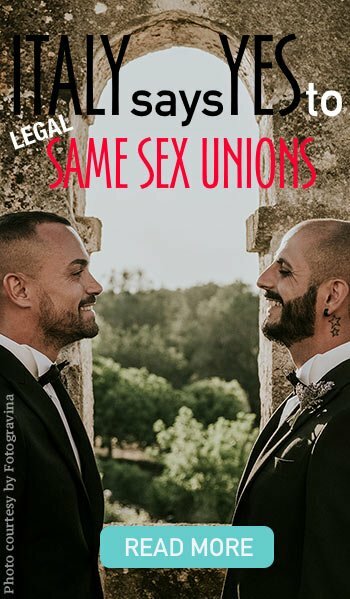 A fine idea for the ceremony. From bride’s house to the church. Many little fabric roses balls on a rubber sphere. 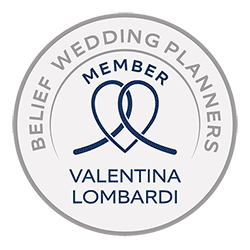 This is something that cannot be forgot on a wedding day! The table chart or also called Tableau de Mariage. 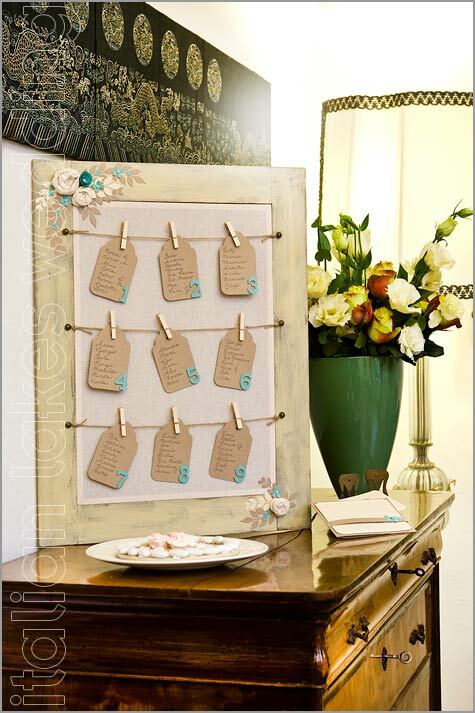 A shabby chich one to tell all your guests their seat. Creating by Coccole & Colori. A wonderful touch of elegance! In a lovely shabby chic frame. It could be placed on each table but also at the entrance of the reception venue. Creation by Coccole & Colori. Same materials and colors. 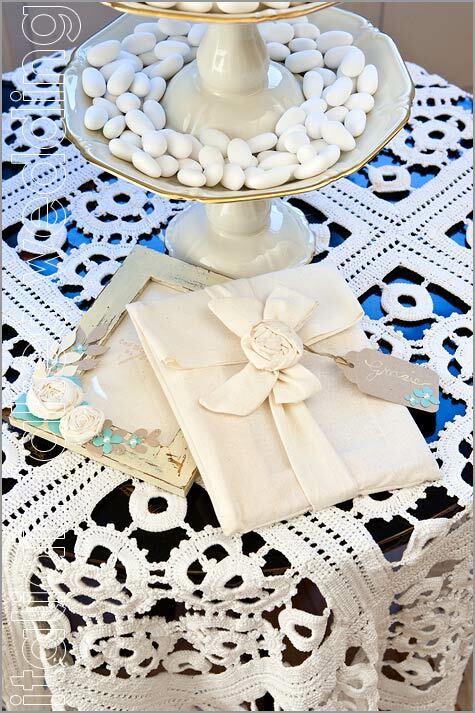 You can create useful items for your party as this lovely napkin holder. Creation by Coccole & Colori. A new way for your sugared almonds presentation. 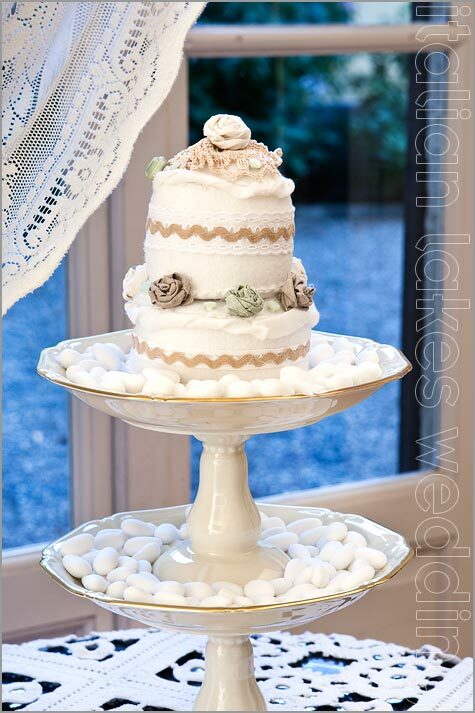 Little trays to create a lovely effect, with a little fabric cake on top. Roses and Laces to decorate it. Isn’t it pretty? Creation by My Country Nest. To thank your guests it could be nice giving them a little favor. You can choose between the frame or the little wedding cake slice. Creation by Coccole & Colori. This is a real masterpiece. 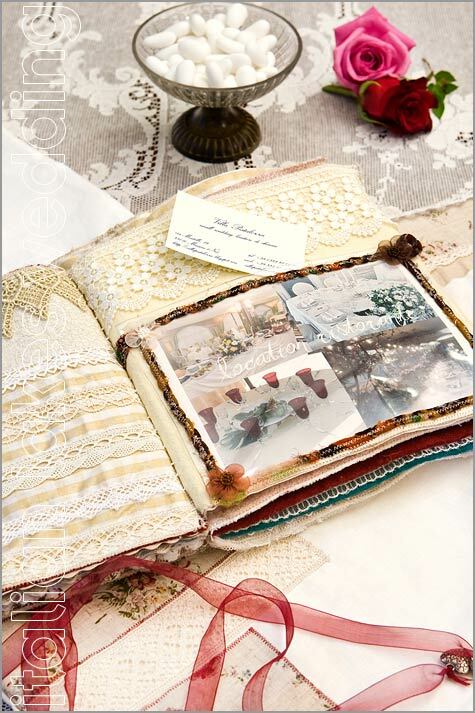 It is a lovely wedding diary made of old cutouts, laces and other materials. 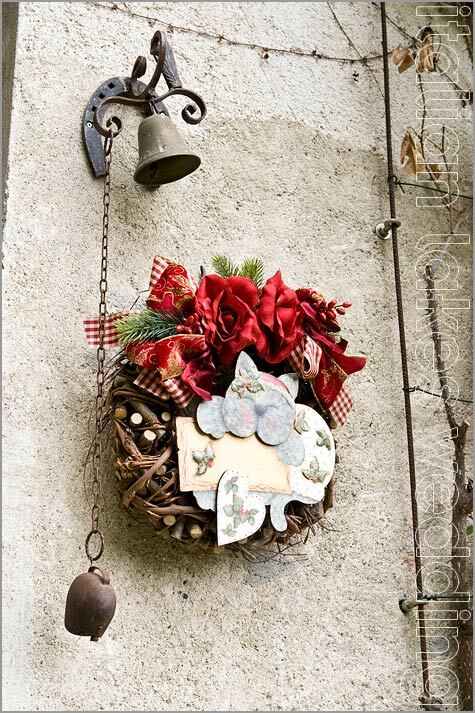 A shabby chic useful object that will collect every single moment of this special event. Creation by Mara Anzolla. This is a very elegant detail, have a look to the details. Each page is different a real triumph or creativity. 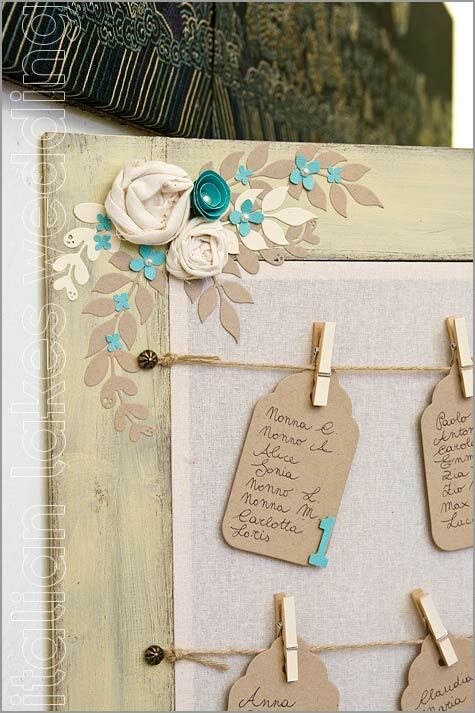 The best way to close your post on shabby chic wedding decor! Thanks again to Donna Giulia, wonderful host of Villa Pestalozza, Sandra Ricci the author of this lovely article on number 18 of Milleidee Home Decor magazine and to Daniele Tenconi photographer, the author of all the images here. 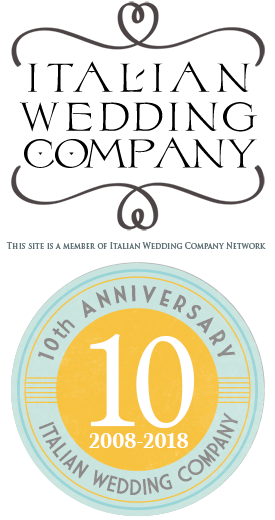 Filling the form below you can contact Donna Giulia at Villa Pestalozza directly. She will be pleased to fix a meeting with you to visit her elegant mansion on Lake Orta. 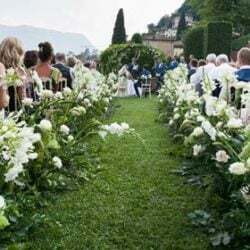 If you are looking for a fine and exclusive wedding venue on Lake Orta you will surely fall in love with Villa Pestalozza! ← Flower girls and ring bearers: a touch of joy for your wedding on the lake!